How long did you wait in the security line at the airport for your last flight? For some lucky travelers, it might have been mere minutes, but, for an increasing number of passengers, wait times have exceeded the length of a flight. Some folks stuck in snarled security lines have even missed their flights. Unfortunately, it’s likely to get worse before it gets better. U.S. airlines are expected to carry a record 231 million passengers during peak summer travel season (June 1 to Aug. 31), an increase of 9 million from last summer, according to trade organization Airlines for America. That’s 2.5 million extra passengers per day, an increase of 95,500 passengers or 4 percent, which means more passengers like these 10 types of travelers fumbling through airport security. We recently surveyed American travelers on their airport security experiences and learned the number one frustration travelers have with waiting in long security lines is dealing with unprepared travelers. Last year we gave you 9 Rules of Airtiquette, which outlines what not to do on a plane, and this year we’re following it up with our airport edition — 16 rules for streamlining the airport experience without coming off like a jet-setting jerk. Here’s to making the skies (and airports) friendlier and more efficient. Boarding pass? Check. ID? Check. Whether you’re a frequent flier or travel just once a year, you know the drill, so stop acting surprised when you’re asked to show them. Shave off seconds in the security line by pulling out these items and having them in your hand before getting in the TSA line. And put that phone away (unless it has your boarding pass on it) well before it’s your turn. Keeping the TSA agent and your fellow passengers waiting because you are more focused on your Facebook feed than your surroundings won’t win you any friends. Just like in traffic and when walking down the street, stay in your lane. Don’t try to skip the line or hop into the Pre✓, CLEAR or jetBlue Even More Speed lanes (unless, of course, you have signed up for one of these programs that will help you breeze through security. If you haven’t, what are you waiting for?). Not a member of Pre✓, but the TSA is waving you over? Run, don’t walk. It’s a fast pass through security and akin to winning the lottery because travelers in these lines don’t have to take their shoes off, take out laptops and liquids or do anything really except empty their pockets (there aren’t any bins here, so you have to shove everything into your bag), put your carry-on through the scanner and walk through the metal detector. If you’ve traveled since 9/11, you know the rules: take off your jacket and shoes. Now is not the time to do a slow strip tease adjacent to the metal detector while everyone glares at you. Start shedding layers and prepping your footwear removal strategy before you reach the end of the line, so you’re not the center of attention for all the wrong reasons. Better yet: dress down. Limit the amount of items you have to take off, like sweaters, belts, hats, watches and jewelry that could set off the alarm (after all, you aren’t on your way to a strip poker game). Finally, heed your grandmother’s advice and wear sensible shoes. Not only will your feet thank you, but so will everyone in line who doesn’t have to watch you painfully peel off those knee-high gladiator sandals one strap and buckle at a time. If you’re traveling with kids in tow, decide in advance who is holding what and which caretaker is helping which child hoist what items through the scanner and ushering the children through security. Assign everyone a role and practice, practice, practice before getting to the airport. Underneath the arch of the metal detector is not the time to argue over who is folding the stroller, who is holding whose hand and why did so-and-so bring this or that toy. Remember to place strollers and car seats on the scanner belt and babies should be carried through a walk-through metal detector by a parent or guardian. Even if you are traveling with kids, pack light. Airlines have restrictions on the number of carry-on items for a reason. A good rule of thumb: If you can’t carry it yourself without assistance from a luggage cart or a posse, you’ve packed too much. If you’re traveling solo with your brood or you’re a fashionista who insists on bringing loads of luggage, do us all a favor and check it. Contain yourself so we don’t all have to helplessly watch you single handedly maneuver a truckload of trunks, two strollers and three screaming kids through security. Finally, make sure you don’t have any prohibited items in your checked baggage. 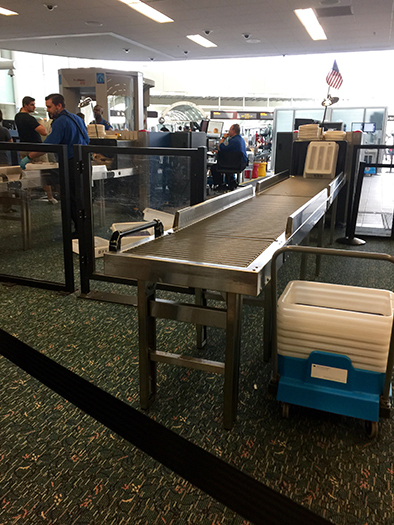 If you are unsure if an item is permitted through the TSA checkpoint, check the TSA’s “When I Fly, Can I Bring My…?” feature, which allows travelers to type in an item to find out immediately if it can be placed in a carry-on bag, checked bag, both or neither. TSA also has My TSA, a free downloadable app that has the same feature. It’s fine to guzzle your water and hydrate while you wind around the line, but toss the bottles before you reach the conveyor belt. Playing hide-and-seek with your beverages and the TSA never works out; you’ll lose every time. Don’t be that guy (or girl). You know the routine by now. Your 3-1-1 bag of liquids, gels and aerosols must be removed from your carry-on bag and placed in a bin. Before your trip, throw all your little liquids in a quart-size zip-top bag and be ready to remove the liquids from your luggage for inspection. Savvy travelers stash liquids in an easy-to-reach spot in hand-held luggage. Avoid sticking your baggie of liquids in your rolling luggage, which requires unzipping your suitcase, unpacking to unearth the liquids, repacking, and a likely wrestling match with the zipper to re-close your suitcase. Stick your liquids in your purse or backpack where they are easy to access. Pack your laptop and tablet in an easily accessible place like the side pocket of your suitcase or a compartment in your backpack to make it easy to slide the device in and out of your bag. Easy in, easy out = perfect packing. Don’t forget to place your laptop (or, in some cases, tablet) in a separate plastic bin. You’ll want to check the rules of the country you’re in before you reach the airport — while the U.S. allows you to leave tablets in your carry-on, others will make you separate it in the same fashion you would a laptop. You’ve just shown the TSA agent your boarding pass and photo ID. Move forward. Don’t wait for your travel companions (unless they’re children, of course). 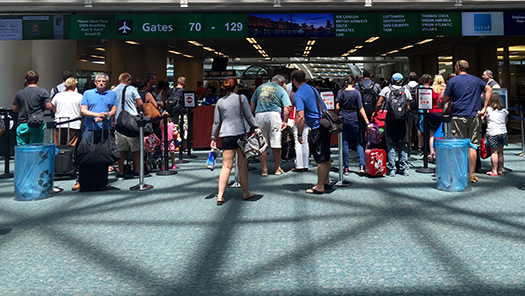 Move two steps forward in line: Put your ID and ticket away (you won’t need them again until you get to your gate). Line is moving again: take your jacket or sweater off. On the move again: Empty the contents of your pockets into your purse, backpack or carry-on. And, you’re moving again: Remove your hat, belt, sweater and accessories. Near the tables and bins? Then, take your shoes off. Within arm’s reach of the bins: Grab two bins – bin #1: all the stuff in your hands from stripping and bin #2: your laptop and/or tablet. Worried you can’t manage to hold on to it all? Stack the bins one on top of the other, put them under your arm and use your free hand to roll your luggage. Near enough to set the bins down on the table? Great! Set them down and pull out your liquids and put them in bin #1 and, if you have one, place your laptop or tablet in bin #2. If space is tight, stack bin #1 on top of bin #2 until it’s your turn. Pay attention and slide on down. When space frees up, hoist your luggage onto the security scanner first, followed by bin #1 and bin #2. 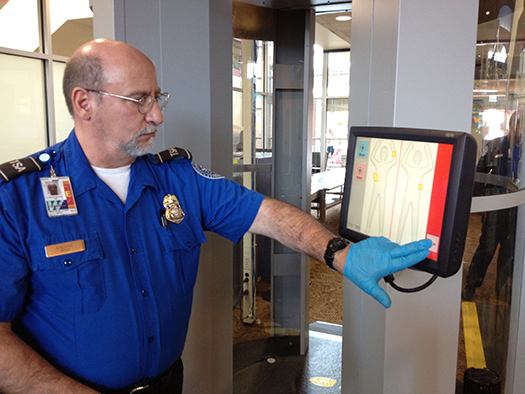 Swiftly go through the metal detector or scanner with nothing in your hands and pockets. Pay attention and look forward for instructions from TSA agents. If at any time during the security screening process you feel frustrated, just go with the flow or, if you need to vent, take out your aggression on social media later. This isn’t the time to talk back to the TSA or play “Are you smarter than a TSA agent?” Focus on being as cooperative as possible for a speedier experience. 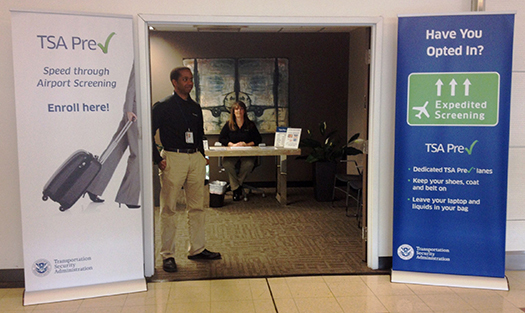 Ask any questions you have about the security process prior to arriving at the airport. 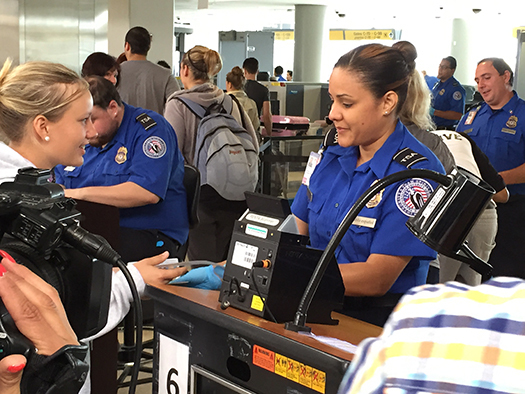 The TSA recommends passengers call 1-855-787-2227 (toll free) 72 hours ahead of travel for information about what to expect during screening and receive answers to questions about screening policies and procedures. It’s important to keep your electronics charged, but avoid putting your patience and other travelers’ patience in the red zone with these charging etiquette tips. If there are no empty spaces available to plug in, but you see someone else’s device is fully charged, don’t unplug it. First, identify whose device it is by asking passengers standing or seated near the charging station. Most folks stand at or keep a close eye on their devices, so it shouldn’t be hard to identify whose electronics are occupying the space you want. On the same note, keep an eye on your device while charging. Some charging stations have seating. Make yourself comfy while you wait , so your devices don’t go on a one-way trip without you. Don’t keep fully charged electronics plugged in as other travelers may be equally eager to charge their devices before takeoff. Finally, if you don’t have a device to charge or you’re already done charging your device(s), move away from the charging station to allow other travelers to power up before takeoff. Better yet, bring your own power strip and make some new friends. Give yourself plenty of time to get to the gate, so you can grab a good seat or rush to a new gate if there is a gate change. Once you have selected a seat, don’t hog the entire row by putting your belongings in each seat. Instead, grab an aisle seat and neatly stack your items next to it. Not only will you get easy access to board the plane, but you won’t look like an impolite passenger either. If you’re traveling with children, the aisles provide more space for kids to play; just keep them contained with quiet games or toys for your sanity and everyone else’s. Figure out how your airline boards its aircraft (from the front, from the back, or by zone). If you’re anxious to be the first to board, upgrade your seat, be a frequent flyer on your favorite airline to rack up status, or figure out which rows board first and select your seat in those areas. Regardless of where you’re sitting, don’t hover at the gate. Wait for your row or zone to be called and then approach the gate with your boarding pass (and passport, if you’re on an international flight), in hand. And always plan your pre-boarding activities accordingly so you don’t hold up the rest of the flight. Don’t be the person who waits until the last minute to close his or her bar tab or books a chair massage that cuts it a little too close. You’re almost there. Resist the temptation to stop, chat, take selfies, or rifle through your luggage on the jetway. Walk with purpose and get on the plane. You’ve waited long enough for this summer vacation, why prolong the process? Similarly, when you’re deboarding, keep moving. Don’t linger on the jetway waiting for friends. Instead, meet them inside at that gate so travelers with connections can make the process as speedy as possible. Check your assigned seat before getting on the aircraft and go directly there. If you want to switch seats, wait until everyone in your section and behind you has boarded before asking the flight attendant if you can make a change.